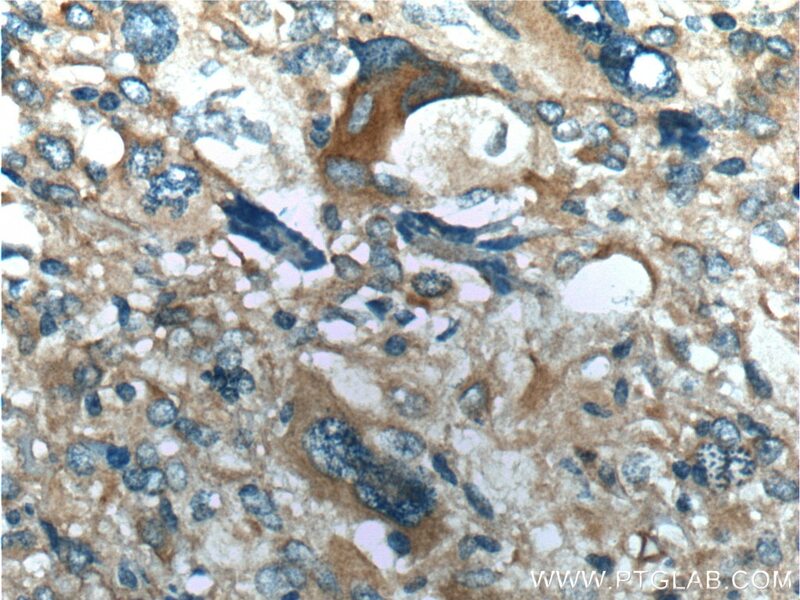 IP Result of anti-OPTN (IP:10837-1-AP, 3ug; Detection:10837-1-AP 1:800) with mouse brain tissue lysate 8000ug. 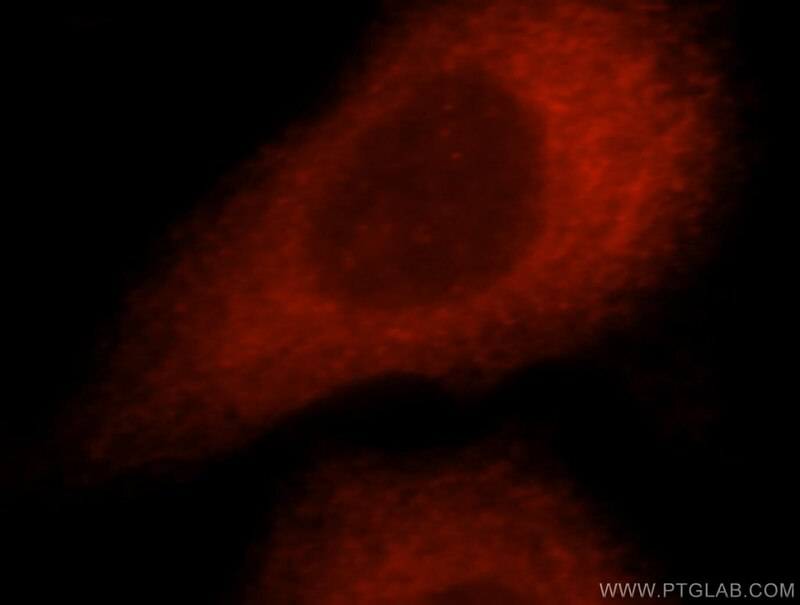 Immunofluorescent analysis of MCF-7 cells, using OPTN antibody 10837-1-AP at 1:25 dilution and Rhodamine-labeled goat anti-rabbit IgG (red). 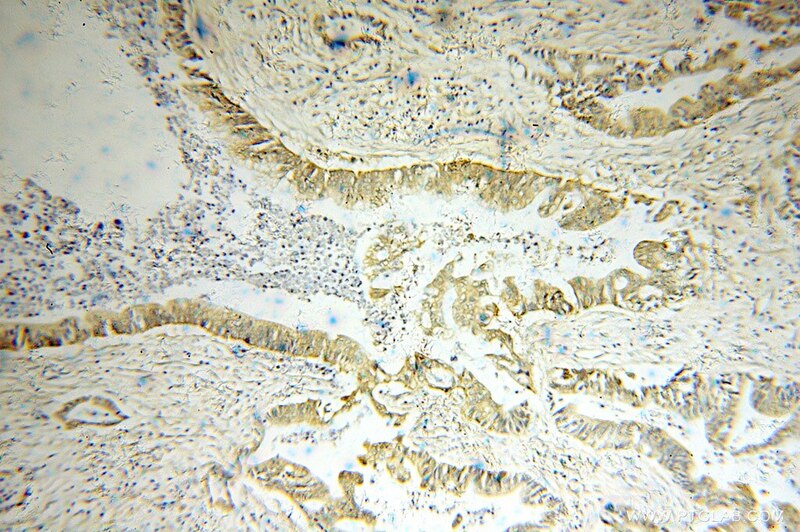 Immunohistochemical analysis of paraffin-embedded human gliomas tissue slide using 10837-1-AP( OPTN Antibody) at dilution of 1:200 (under 10x lens). 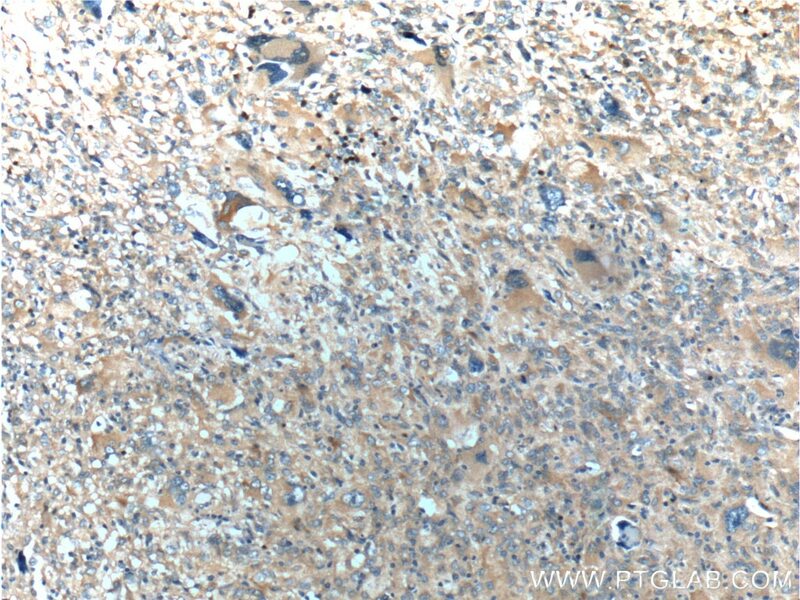 Immunohistochemical analysis of paraffin-embedded human gliomas tissue slide using 10837-1-AP( OPTN Antibody) at dilution of 1:200 (under 40x lens). 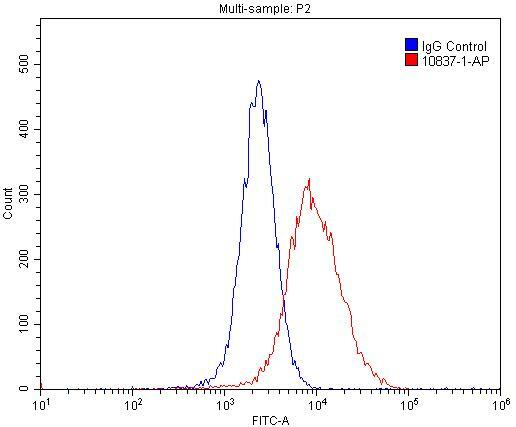 1X10^6 MCF-7 cells were stained with 0.2ug OPTN antibody (10837-1-AP, red) and control antibody (blue). Fixed with 4% PFA blocked with 3% BSA (30 min). Alexa Fluor 488-conjugated AffiniPure Goat Anti-Rabbit IgG(H+L) with dilution 1:1500. OPTN, also named as FIP2, GLC1E, HIP7, HYPL and NRP, plays a neuroprotective role in the eye and optic nerve. 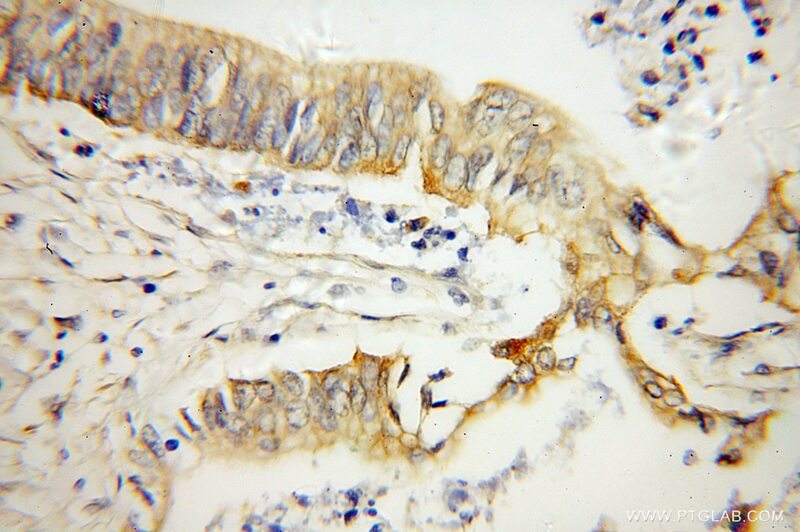 It is probably part of the TNF-alpha signaling pathway that can shift the equilibrium toward induction of cell death. OPTN may act by regulating membrane trafficking and cellular morphogenesis via a complex that contains Rab8 and hungtingtin (HD). OPTN may constitute a cellular target for adenovirus E3 14.7, an inhibitor of TNF-alpha functions, thereby affecting cell death. Defects in OPTN are the cause of primary open angle glaucoma type 1E (GLC1E). Defects in OPTN are a cause of susceptibility to normal pressure glaucoma (NPG). OPTN mutated in adult-onset primary open angle glaucoma. It supports the protective role of OPTN in the trabecular meshwork. OPTN has 3 isoforms with MW 66、65 and 60 kDa (refer to UniProt). 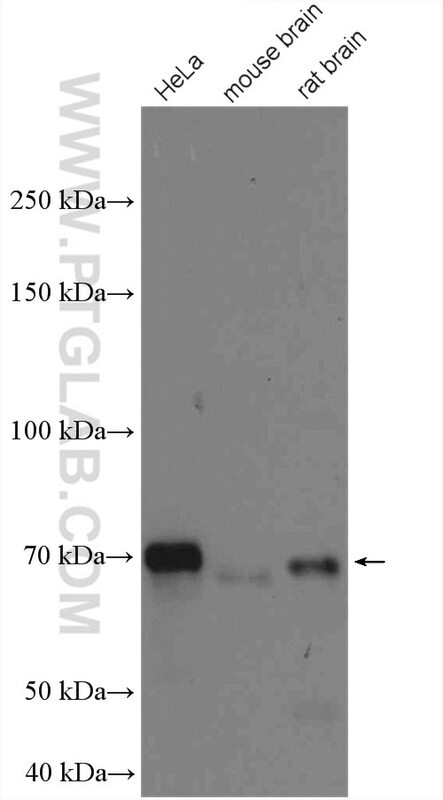 Catalog#10837-1-AP recognises 66 and 70-74 kDa band, and the additional 70-74 kDa band due to phosphorylation. Atg8 family LC3/GABARAP proteins are crucial for autophagosome-lysosome fusion but not autophagosome formation during PINK1/Parkin mitophagy and starvation. Mitophagy and mitochondrial biogenesis in atrial tissue of patients undergoing heart surgery with cardiopulmonary bypass. Phosphorylation of Rab-coupling protein by LMTK3 controls Rab14-dependent EphA2 trafficking to promote cell:cell repulsion.